Riparian Plant Restoration has been incorporated into Pacific Island Plant Restoration and is no longer available online. Please click here to be redirected to the key available at the Hawaii Conservation Alliance's webpage. 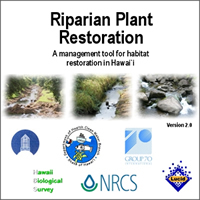 Riparian Plant Restoration is a computer-interactive key for the identification of native Hawaiian plant species appropriate for restoration in riparian (streamside) locations. It was developed by Bishop Museum with the support of the U.S. Environmental Protection Agency, the Hawaii State Department of Health Clean Water Branch, and Group 70 Foundation Fund. Riparian Plant Restoration (Authors: L.M. Crago, C.F. Puttock, and S.A. James) compiles information from current restoration projects and comprehensive literature research with guidance from engineers, hydrologists, botanists, soil scientists, and conservation biologists. Version 1.0 funded by the NRCS Tropical Technology Consortium, was a model based on 37 species commonly used in current streamside restoration projects. Version 2.0 incorporated 107 species (100 native Hawaiian species and 7 Polynesian introductions). The establishment or preservation of a riparian buffer is essential in the reduction of nonpoint source pollution of Hawai‘is streams, waterways, and oceans. Healthy native riparian buffers trap sediment, slow water velocity, reduce flooding risk, increase water absorption, filter out pollutants, reduce erosion, and increase streambank stability. Buffers also provide a shelter and food source for native birds and insects and are aesthetically appealing. All media are for the personal use of students, scholars and the public. Any commercial use or publication of them is strictly prohibited. © Bishop Museum, 2009. All rights reserved.